Ask your typical utility customer what it means to be energy-efficient, or what “green energy” is, and you’re likely to get a fairly well-informed response. The idea of using less energy or using solar panels and wind turbines to lower pollutants is pretty easy to understand. But ask those same customers if they know how to be “capacity-efficient,” or to describe how renewable energy and traditional power plants compare in terms of providing capacity to the power grid, and you’re more likely to get blank stares. That’s because the concept of capacity -- a measure of how much reliable electricity generation the grid needs to meet ever-changing peaks and troughs in energy demand -- hasn’t been something that the average utility customer has had to know or worry about. Instead, capacity has largely been the concern of grid insiders like utilities and transmission system operators, power-plant owners and investors, and state and federal regulators. But in a world where utility customers are increasingly generating their own energy, fine-tuning their moment-by-moment power consumption, and striving for “net-zero-energy” status, this disconnect between energy and capacity can become a serious roadblock to achieving a clean, efficient and reliable grid. The utility-funded Electric Power Research Institute has spent the past few years highlighting these kinds of challenges in its “Integrated Grid” research initiative. On Monday, EPRI released its most recent report from the initiative, which delves into the data behind this energy-capacity divide, and lays out how technology advances and new regulatory and economic frameworks might help close it. This concept is critical to understanding why utilities are seeking to impose fixed charges or minimum monthly bills on their solar-equipped customers, and a point of contention for rooftop solar companies like SolarCity that are fighting back against these proposals. It’s fundamental to the shift to time-of-use energy rates that match the cost of generating energy at times of peak demand to its price. And it’s central to analyses such as the Rocky Mountain Institute’s “Load Defection” report, which predicts that the ever-falling costs of rooftop solar and behind-the-meter batteries will further disconnect energy-independent customers from supporting investment in the capacity that’s required to keep the grid working efficiently for all customers. 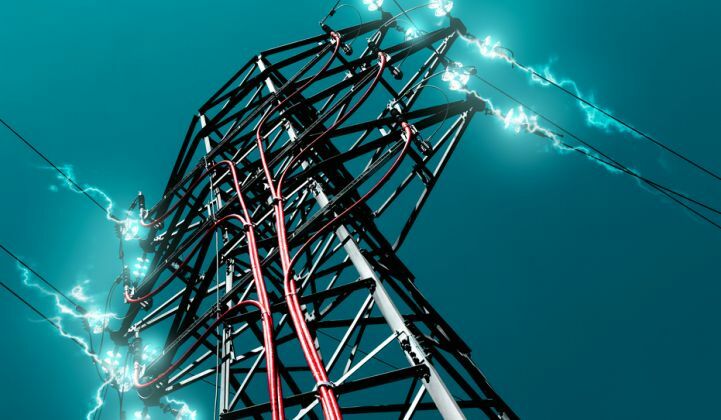 EPRI’s report helps define the utility stance on why capacity matters, and how the cost of providing it is disconnected from the way customers understand and pay for electric service. Here's a summary of the data it has collected on the challenge, and the recommendations it provides for what to do about it. Traditionally, peak demand and energy have followed each other pretty well, said Mansoor. But in the past decade or so, that’s started to change. While the U.S. electricity system has seen a flattening in growth of energy consumption, the growth in capacity needed to supply peak loads across the country has continued to climb, as this chart from the U.S. Energy Information Administration indicates. Researchers attribute the split to various factors, according to Ben York, EPRI senior project engineer and co-author of Monday’s report. In simple terms, there’s plenty of economic incentive and technology improvements that drive homeowners and businesses to reduce overall energy use, but not nearly as much to get them to reduce energy use at moments of peak electricity demand. Utilities generally recognize the costs of providing capacity in fixed infrastructure costs required to provide reliable electric service, he said. 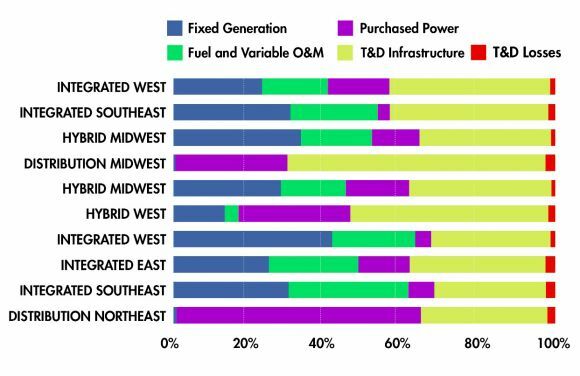 As part of its analysis, EPRI collected reams of publicly available data from range of U.S. utilities to try to break out how much of their costs fall into energy versus capacity buckets. This analysis differentiates utilities by what part of the country they’re in, and what kind of regulatory regime they operate under, he said. Some are more traditional vertically integrated utilities -- those that own some generation assets, transmission and distribution grid assets and maintain direct relationships to their customers. Others in deregulated or competitive energy markets own only distribution grid assets. And a third “hybrid” class falls in between -- not entirely deregulated, but not vertically integrated either. “All of them have some type of fixed infrastructure costs that are required to provide reliable electric service,” York said. While the split between variable and fixed costs ranges depending on which category they fall into, between 35 percent and 75 percent of total costs are fixed -- meaning they don’t depend on how much energy is used. 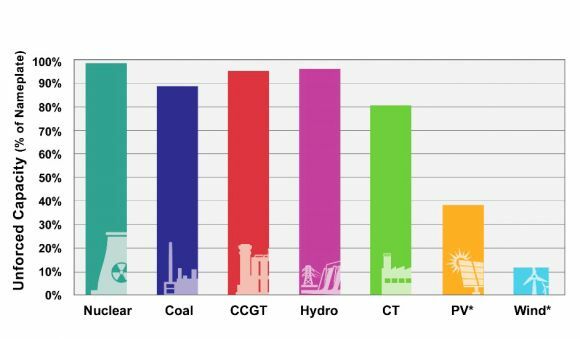 Traditional power plants are pretty well aligned in energy and capacity -- they can be turned up or down to match energy demand. Solar and wind power, by contrast, aren’t always available at times that match peak demand, and have lower “unforced capacity” ratings as a result. 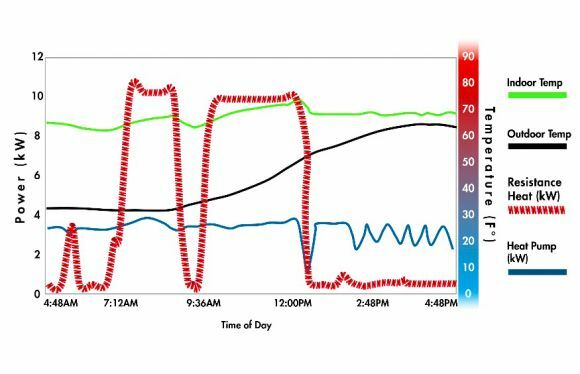 Here’s a graphic using data from mid-Atlantic grid operator PJM that illustrates this difference. Some amount of extra capacity needs to be found to cover the gaps in renewable energy output. That can come from fossil-fuel-fired power plants or large hydroelectric resources, which is the traditional way to back up intermittent wind and solar power. 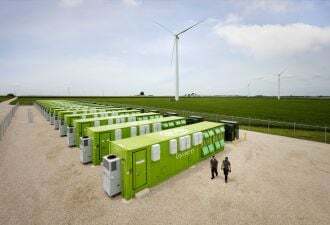 But as we’ve seen in renewable-rich energy regimes like those in Germany, that can cause significant economic disruption, as power plants are forced to operate in ways that decrease their efficiency and, in some extremes, force them into money-losing operation patterns. But additional capacity can also come from more novel grid resources, such as demand response or energy storage. These can be much less expensive and less greenhouse-gas-intensive -- but only if properly utilized for the purpose. This planners’ conundrum gets even more complicated when it moves from central and controllable utility-scale resources and into the realm of distributed energy. 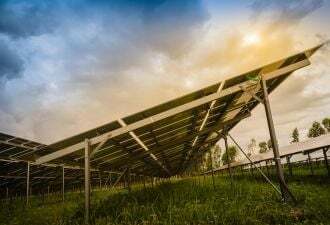 That’s the realm Greentech Media has dubbed the grid edge, and it requires a whole new layer of technology to manage, as well as new regulations and economic constructs to realize its potential value. EPRI is actively involved in a slew of projects to help align the ability of distributed energy assets to provide both energy and capacity at the times they’re needed. One of its most recent projects with the Department of Energy’s National Renewable Energy Laboratory (NREL) is part of a broader effort to test how software, hardware and communications systems can be integrated into distributed energy resource management systems (DERMS) -- allowing rooftop solar, demand response, energy storage and other distributed energy resources (DERs) to work with utility grid gear and control systems. In the meantime, some of the more advanced energy-efficient equipment out there today can actually reduce the amount of capacity that’s available at moments of maximum grid demand, York noted. Take heat pumps, which capture ambient air temperature to help heat and cool buildings. Those work very efficiently when temperatures are mild to moderate. But when it gets too cold, they have to draw electricity from the grid to activate resistance heaters keep indoor temperatures stable. That instantly erases their energy-efficient nature, and at the precise time when the grid is struggling to provide enough energy to keep everyone’s homes from getting too cold or too hot. 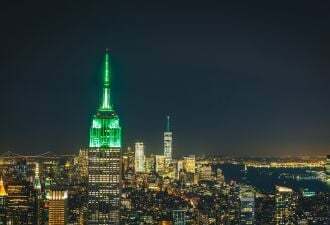 There’s got to be a way to encourage customers to keep investing in energy efficiency, while also providing incentives for them to install technology and change energy consumption patterns in ways that promote capacity efficiency. While Mansoor noted that “it’s not our role to prescribe which rate structures work best,” EPRI’s report does lay out some new policies that could help promote customer capacity efficiency, such as time-of-use rates that rise to match the costs of providing capacity, or demand charges that charge customers based on their peaks in electricity consumption. 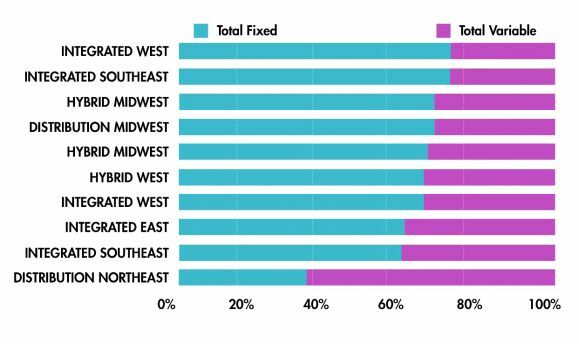 These rate structures are commonly used for commercial and industrial utility customers, but are far less common for residential customers -- and they come with their own threats of burdening residents with complicated and costly new utility charges. Relying on rate and tariff structures to enable residential capacity assets will also require a high level of automation, Mansoor said.